A daily staple in our lives is the cell phone. Whether you use it for calling, texting, gaming, selfies, or social media – it’s always there. One organization knows the importance of this modern tool and wanted to make sure that deployed soldiers do not feel this void in their lives. Cell Phones for Soldiers is a nonprofit dedicated to getting those serving free communication services. The two youngsters decided to make a difference. They took all the money they had in their piggy banks, scrounged up extra lunch money and even put on a car wash to send money to the man they saw on TV. From that point as kids to this very day, Cell Phones for Soldiers has exponentially grown. With three staff members, thousands of volunteers and over 3,900 recycled cell phone drop off locations, their childhood goal has become a big resource to the military. “During National Military Appreciation Month, we along with our friends at KIND Snacks are asking for help in thanking our troops and veterans for their sacrifice and bravery,” Robbie states. From this point through May 31st, he asks that those on Twitter use the hashtag #thankskindly and thank the military with the trend topic. “Robots will then transform the tweets into physical, handwritten notes and we’ll deliver the notes to deserving heroes worldwide,” he continued. You can see how the robots do it here: http://www.kindsnacks.com/thankskindly/. 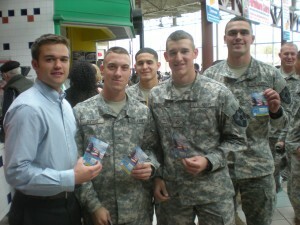 Visit the site for Cell Phones for Soldiers at www.cellphonesforsoldiers.com, like them on Facebook and follow on Twitter @CPFSOfficial. Want information on VA Home Loan? Visit: https://www.vahomeloancenters.org/va-hlc-home-loan-info/. Check out your other government home loan options, like the FHA Home Loan: https://www.fedhomeloan.org/apply-for-a-mortgage/ and the USDA Home Loan: https://www.fedhomeloan.org/usda-home-loan-information-resources/. Visit us any time at https://www.vahomeloancenters.org with our convenient chat feature, or call us at 1-888-573-4496. Follow on Twitter and like us on Facebook.